When we first tried to mount my ownCloud through WebDAV in Windows as a Network Drive, we failed. When we later Googled the issue we found out that Windows has problems with mounting Network Drives in that way. 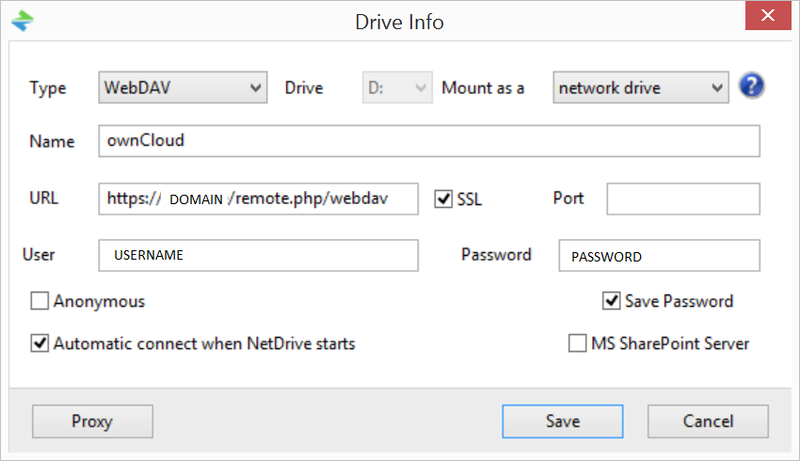 With NetDrive you can mount your ownCloud with WebDAV in Windows. One of the benefits are that your files doesn’t allocate any space on your local hard drive, WebDAV is directly connected to your server. This makes it possible to have a very large cloud storage and sync it with a computer with a very small hard drive, ideal for laptops for example. So as an alternative of using the regular ownCloud client, use Netdrive if you have limited storage capacities. Of course you can use NetDrive with other services than ownCloud as well.